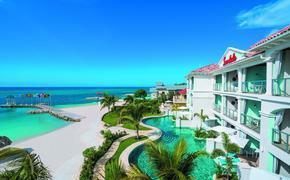 Grand Residences Riviera Cancun features lavish suites, impeccable service and a range of cuisine and activity options. 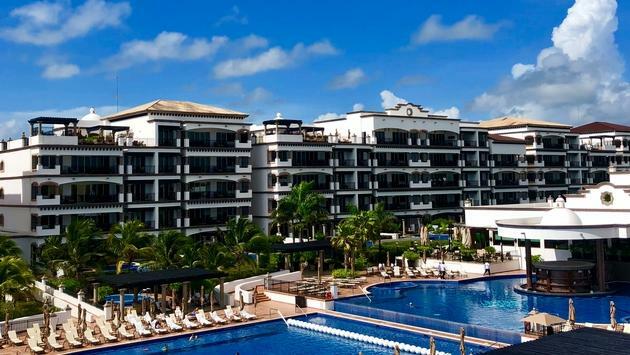 Nestled in the fishing village of Puerto Morelos on the Riviera Maya, Grand Residences Riviera Cancun overlooks the white sands and turquoise waters of the Caribbean Sea. Part of the Leading Hotels of the World, this upscale property offers lavish suites, impeccable service, multiple restaurants, a gourmet food market and four pools, including a quiet lap pool and a stunning double-infinity pool with swim-up bar. Fanciest and Most Common Accommodations: Grand Residences has 144 beautifully appointed suites and villas, 103 with ocean views. All suites feature Bulgari bath amenities, Nespresso coffeemakers, handmade furniture and a large Jacuzzi and outdoor terrace. For the epitome in luxury, consider booking your clients in the four-bedroom, 8,762-square-foot Penthouse Presidential Suite, which can accommodate up to 13 guests. It has two master suites and two junior suites, each with its own entrance, as well as a private rooftop garden and private swimming pool and Jacuzzi. The one-bedroom, 1,798-square-foot Master Suite houses up to five guests and its private terrace offers spectacular beachfront or ocean views. What's Included: The property offers a European Plan and the “All-In Grand Experience,” which includes all meals, international house bar and in-suite refrigerator stocked daily with bottled water, soda and beer. The resort offers amenities such as private airport transfers, a bottle of tequila, 24-hour room service, cooking classes, one formal afternoon high tea, mixology lessons, tennis, Zumba lessons, complimentary Wi-Fi and free coffee all day in the lobby bar. The pool area offers such pampering touches as Evian facial sprays, ice lollipops and five-minute sunscreen massages. What's for Dinner: The elegant El Faro Grill offers Mexican classics, fresh seafood, prime steaks and Italian specialties, in addition to views of the pools and the ocean. Flor de Canela, the Mexican gourmet restaurant, emphasizes fresh seafood. Taco buffet nights here are impressive. Who Books This Resort: Mainly families, couples, honeymooners, destination wedding parties, and groups of friends. Many are from the U.S. and Canada. The kids’ club offers pool games, sandcastle building competitions, treasure hunts, beach walks and traditional Maya games. The teens’ club includes beach soccer, water polo and movies. Insider Booking Tips: For utmost relaxation, recommend the Oceanfront Master Suites with patio Jacuzzis. Those located in buildings 300 and 400 are quiet and private and enable your clients to wake up to stunning sunrises from their spacious balconies. Honeymooners will love the Master One-Bedroom Ground Floor Suites, which have their own private pool, Jacuzzi and garden area. Highly recommend the all-inclusive plan as menu items are well selected by the executive chef and the cuisine is delectable. Key Selling Points: Service is impeccable. Staff not only to meet but anticipates and exceeds guests’ needs.